In addition to examining how the accident progression in the reactors was addressed and conveyed to the general public, the paper will discuss how evacuations from areas in close proximity to the Daiichi NPP were conducted, and how the exclusionary zones where determined by Japanese and foreign governments in Japan. 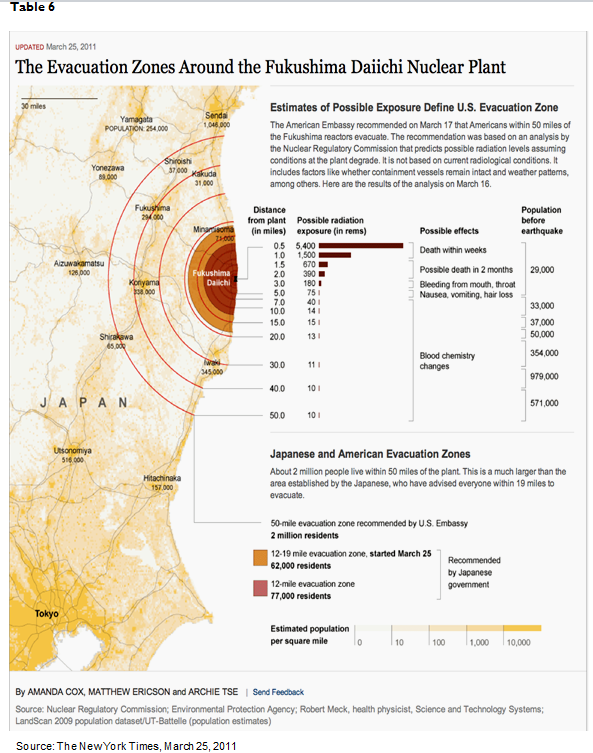 As the crisis unfolded and efforts to bring the reactors under control were initially proving ineffective, concerns increased that radiation dispersion was unmitigated, and with radiation monitoring by the U.S. military indicating levels significantly beyond TEPCO’s conservative assessments, the United States broke with Japan, recommending an 80km exclusionary zone, and initiating military assisted departures for embassy staff and Department of Defense dependents from Japan. 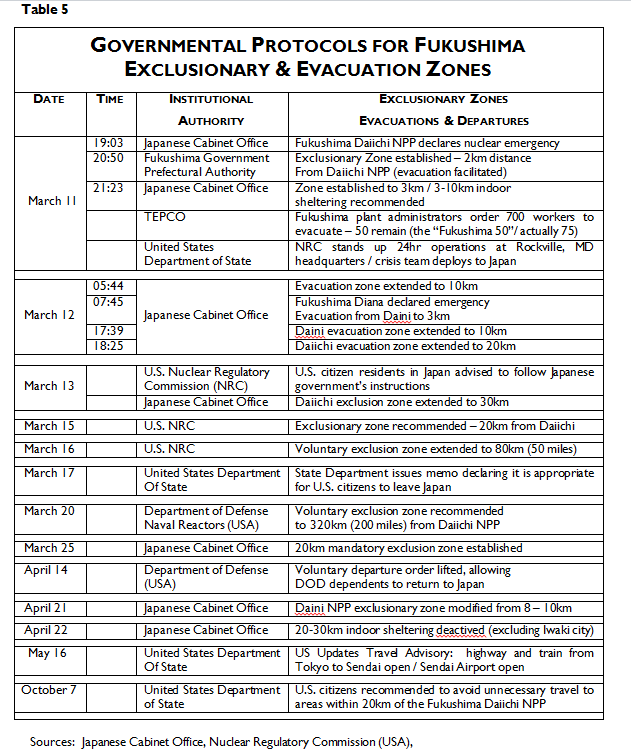 These actions deviated significantly from Japan’s assessments (which had established a 30km mandatory evacuation zone), creating a dynamic where the U.S. provided technical consultation for the nuclear response while striving to maintain a delicate diplomatic balance as they attempted to impose a qualitatively different crisis management response. Alongside the U.S. response, various European Union States moved their embassies to Western Japan, distributed Potassium Iodide (K1) to their expat citizens in Japan, and in some cases, left Japan altogether for the duration of the crisis. This paper will examine the implications of foreign government responses to the nuclear crisis for Japan’s international relations, both in the early phase of the nuclear crisis, and in the long-term, as Japan continues to coordinate its emergency response protocols with international nuclear agencies, and implement internationally recognized standards in its remedial efforts to ensure public health, and, to restore international credibility. This paper addresses issues related to the social construction of risk, based on the nuclear crisis in Japan, which followed in the wake of the 3.11 earthquake and tsunami. The paper analyzes institutional response to the nuclear crisis, looking at how various governments assessed the situation and set policy in the early phase of this ongoing crisis. The first few days of the nuclear crisis were rife with drama, but much of this remained obscure and unknown outside the networks of key decision-makers in Japanese and foreign government agencies whose priorities framed the general perception of risk that prevailed in this phase of the crisis. The narrative that follows (much abbreviated for this prospectus) provides information on backstage decision-making by political elites that raises questions about how the crisis has been previously characterized, and provides a reference point against which to measure subsequent views as the crisis evolved over the longer term. The paper touches on the differences in perception between various foreign governments and examines the political implications of the crisis for international alliances in Japan. In the fitful hours after Japan experienced its largest ever recorded earthquake and a devastating tsunami, attention turned to the Daiichi nuclear power plant (NPP) in Fukushima. There was no doubting the significance of this crisis, but calibrating the actual risk and danger that this presented to the general public was a moving target, with competing risk narratives that developed almost immediately after the initial news reports were released (Samuels, 2013). From the beginning of the crisis, Japan-based foreign embassies and their supporting governments overseas sought to establish lines of communication with TEPCO via the Japanese government, but they were often rebuffed and even when lines of communication had been established, there was little to relate, as even the Japanese government could not attain meaningful information from TEPCO, who continued to downplay the severity of the situation (Sposato, W. Personal Communication, October 22, 2011). Because of its long-standing strategic political alliance with Japan, buttressed by the largest array of military bases in Asia and the only forward-deployed nuclear aircraft carrier group in the U.S. military, the United States was the most significant foreign responder in tsunami relief efforts and provided the most meaningful consultation and logistical support in the nuclear crisis. [i] While U.S. governmental organizations that had even a cursory stake in the crisis worked the event, the lead agency that provided consultation and support was the Nuclear Regulatory Commission (NRC). From the onset of the nuclear crisis through the following year the NRC assigned over 200 staff stateside and sent a core team of 16 NRC staff and nuclear experts to Japan. In the early days of the nuclear crisis as concerns about plumes of radioactive gases wafting across Fukushima became central, the NRC had remarkably little information with which to assess the reactor crisis, relying only on a streaming data feed from TEPCO via the MEXT website, briefings by the Foreign Ministry and media reports. Because of the paucity of data and the lack of communication with TEPCO, the U.S. government quickly set up a parallel process of radiation assessment and began conducting radiation surveys, ostensibly to protect their personnel from exposure as they worked tsunami relief efforts, but also because of a lack of faith in what TEPCO was conveying. The U.S.’s vast array of resources included the Department of Energy’s Atmospheric Monitoring System (AMS), on the ground radiation measurement surveys, fixed station radiation monitors, Global Hawk military drones and classified military surveillance (the Lockheed U-2 high-altitude reconnaissance aircraft) to help with the assessment. 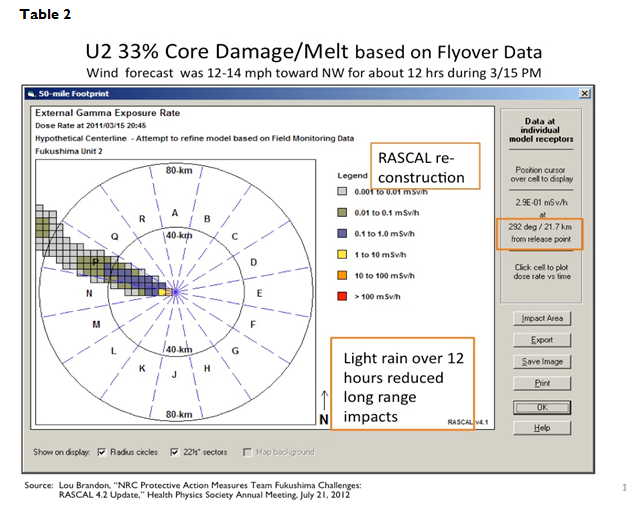 In addition to these means of radiation measurement, the U.S. relied on the NRC’s Radiological Assessment System for Consequence Analysis (RASCAL, an atmospheric modeling program run out of the National Atmospheric Release Advisory Center at the Lawrence Livermore National Laboratory in California. The U.S. military, working closely with the Japan Self-Defense Forces (SDF), was a significant first-responder to coastal villages that had been swamped by the tsunami. The U.S. Navy’s Ronald Reagan aircraft carrier group, parked off the coast of Fukushima, served as a fueling platform and staging area for tsunami relief, at which time U.S. servicemen simultaneously working relief efforts and the reactor crisis were exposed to radiation emanating from the reactors. As the wind was blowing out to sea for the first couple of days after the onset of the crisis, aside from local communities nearby the Daiichi facility, this nuclear powered aircraft carrier was among the first to be exposed to the radiation plume from the explosion of the Reactor 1 building at 3:36pm on March 12. The exposure levels both on the ship and those acquired by aircraft going over the reactors were alarming, provoking the carrier group to back off from 60 to 180 nautical miles from the plant. The explosion of the Reactor 1 building fundamentally changed the dynamic of the event, causing considerable alarm within the nuclear community, as this explosion indicated significant core damage,[ii] leading nuclear experts watching from afar to envision a far more troubling situation than the Japanese authorities were conceding. These concerns were soon vindicated when the unit 3 reactor building and the upper area of reactor 4 exploded on March 14 (11:01 JST) and 15 (06:00 JST). 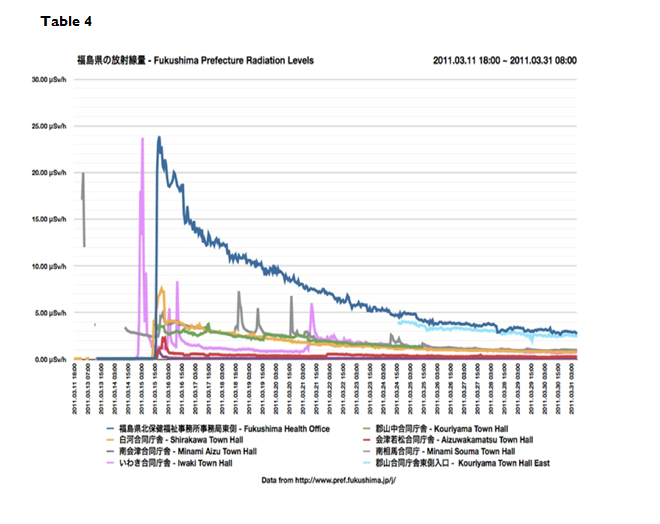 These consecutive explosions demonstrated that TEPCO’s assurances were unfounded, and although it was not yet known to the general public, it was at this time (in the early morning of March 15) that TEPCO announced that it intended to withdraw from the plant due to the extraordinarily high level of radiation to which plant workers were being exposed. This announcement caught the Kan administration and the U.S. government off guard, and in recognition of the potential consequences they exerted enormous pressure on TEPCO to remain, essentially requiring TEPCO to maintain a sufficient number of staff to manage the operation at all costs. The implications for this were ominous for the TEPCO staff, as the magnitude of the nuclear accident was growing with no resolution in sight, and the remaining staff faced the prospect of lethal doses should they remain. In retrospect, the true intentions of TEPCO remains obscure, but this dispute was important in that it indicated in explicit terms that PM Kan did not trust TEPCO to fulfill their duties, and it established a dynamic of accusation and distrust between the principle players and organizations at the center of the crisis (Asahi Shimbun, September 7, 2011). It was into this fray that the U.S. and the other principle players involved in the crisis entered as they futilely attempted to glean information upon which they could make an assessment that would orient their actions productively. Foreign entities who were frantically trying to gather information saw a demoralizing situation: a utility who had lost control of the plant, who seemingly were incapable of taking effective remedial action and who were fighting with the Japanese government while the plant reactors fell like dominos, with no end in sight. The prospect of TEPCO withdrawing from the plant focused everyone’s attention, as this would have truly been the nightmare scenario that alarmist pundits had been suggesting. Had TEPCO withdrawn operational staff from the Daiichi facility, all the reactors and spent fuel pools would have eventually melted down, releasing such severe levels of radiation that eventually the staff at the Daini facility (located 11.5 kilometers south of the Daiichi NPP) would also be forced to withdraw, with the result being that all the reactors and spent fuel pools at this plant would also have melted down. Given the fact that the spent fuel pools contain approximately 5 – 6 times more radioactive nucleotides than a working reactor, this would have been orders of magnitude more severe than the Chernobyl accident. It was with this in mind that the Japanese government seriously discussed evacuating Tokyo (in the U.S. embassy, planning began to put thousands of Americans on the decks of the aircraft carriers to get them out immediately). For the U.S. government, this would have jeopardized their ability to maintain the military base structure in Japan in the long-term, an unthinkable prospect that would have compelled them in the short term to fully engage in the task of sorting the reactor crisis (despite the prospect of facing lethal does in the process), in coordination with the Japanese Ministry of Defense. Although this has not yet been revealed to the public due to diplomatic sensitivities, backstage a series of highly contentious communications passed in short order between the U.S. Pacific Command (PACOM), the U.S. State Department (via the U.S. Ambassador Roos, who talked with President Obama via conference call), the Japanese Ministry of Foreign Affairs, the Prime Minister’s office and TEPCO about the implications of TEPCO leaving the plant. It was at this time that PM Kan confronted TEPCO, first at 3am in the morning of March 15 at their headquarters in Tokyo and later that morning at the Daichi facility. The U.S. government accounted for its advisories as “best-practices” recommendations made “out of an abundance of caution, and in order to enable U.S. government officials and the uniformed military to concentrate on the tasks at hand” (U.S. Department of State, 2011). These vague platitudes did not include the underlying reason for why such caution was deemed necessary. 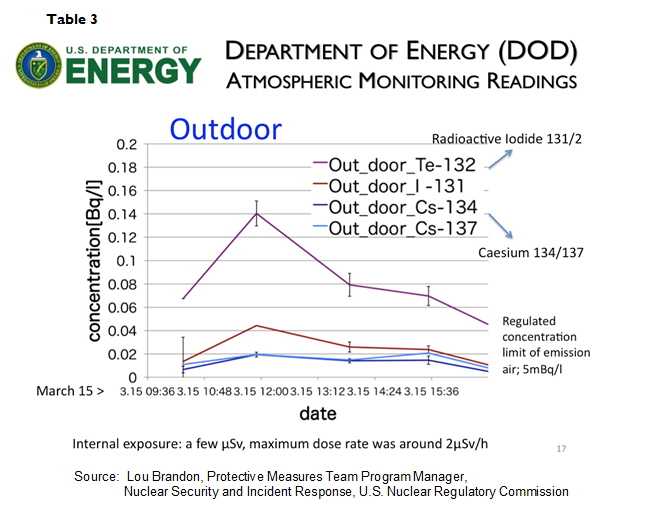 On March 15th, the same day that DOE measurements in Tohoku revealed radiation levels beyond public safety thresholds, a hotspot reading near the Yokosuka military base was so high that Naval Reactors, in this context the primary organization responsible for radiation assessment for the Department of Defense, recommended a 200 mile (322km) exclusionary zone. This drove decision making at this crucial moment, giving reason and rationale for the military assisted departures (Yokosuka is 163 miles from the Daiichi NPP), temporarily trumping the NRC’s 50 mile exclusionary zone, which was a pressing concern as NRC Chairman Gregory Jaczko was preparing to appear before Congressional oversight hearings where he would be called upon to justify the U.S. response and face critical scrutiny (U.S. Government Printing Office, 2011, March 29). 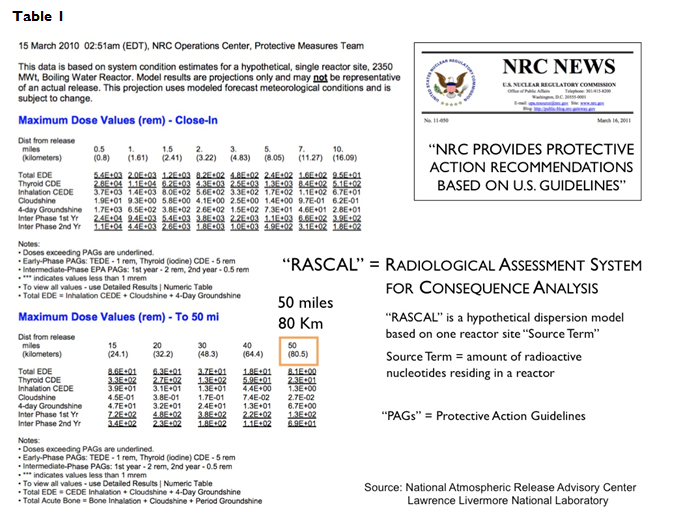 After putting the data through a peer review process (Naval Reactors tasked 6,300 staff across two labs to scrutinize the data; the NRC ran a parallel process), and comparing this reading to the radiation survey data in Tohoku (extrapolating readings from near the reactors to correlate with more distant readings as in Yokosuka), it was determined that this unexpectedly high reading was an unrepresentative outlier, owing to a measurement error or a transient spike from random particulate fallout. After a short-lived but spirited dispute, eventually Naval Reactors and the NRC came to a tenuous consensus on the 50 mile exclusionary zone. In the meantime, the voluntary departures had already commenced. In retrospect, the assisted departures and the grave concern and subsequent political contretemps that accompanied them may have been avoided if the press of events at the time did not compel immediate action. At the same time international cooperation was ramping up for tsunami relief, foreign embassies in Japan began to discuss evacuation of foreign nationals to escape the nuclear fallout while managing the perceptions of their staff and Japan-based constituents as the situation continued to deteriorate with no respite in sight. This was a tricky balance, and it took considerable finesse to implement procedures out of line with the Japanese response while seeking to avoid the diplomatically troubling insinuation that these policies were an implicit critique of the Japanese government’s crisis management procedures. 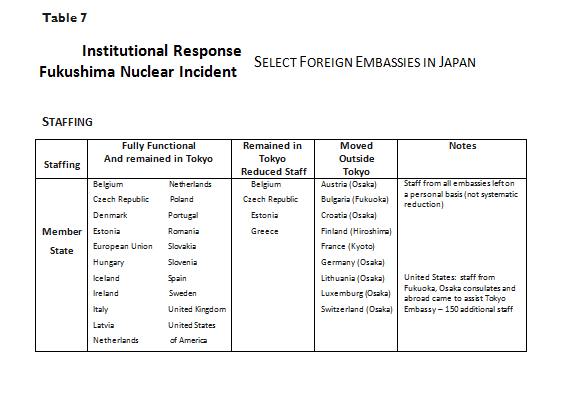 The U.S. response framed institutional policy among the other embassies, which oriented their travel advisories in Tohoku to the U.S. NRC’s 50 mile (80km) exclusionary zone, but with few foreign residents in Tohoku, the primary impact from this was on Tokyo-based embassies and foreign residents in the Kanto plain. Several embassies temporarily relocated outside Tokyo to Western Japan to ensure that embassy functions could be maintained even in the worst-case circumstances. This was not well received: embassy officials endured highly contentious town meetings, facing accusations of stonewalling, deception and insensitivity from their constituents (Stanzel, personal communication, December 8, 2011). The German reaction to the nuclear crisis was considered an outlier among the other foreign embassies, a response that was influenced by domestic anti-nuclear sentiments back in Germany, which compelled the ruling government to accelerate recently, announced plans to discontinue the use of nuclear energy. These domestic pressures contributed to the Tokyo embassy’s decision to move to Osaka, causing some resentment among the other foreign embassies that held the line in the first few days of the crisis. Fully six months after the crisis began, the German Embassy remained understaffed due to concerns about the nuclear situation, with ten posts (about one fourth of its diplomatic staff positions) remaining unfilled, as existing staff fled to Germany and refused to return, and prospective candidates refused to come while the situation was still uncertain. To help allay concerns, the German Embassy installed a full-time radiation expert in the Tokyo embassy (rotating in six experts over the following year). A disaster such as the one which occurred in Japan last year and which precipitated a nuclear accident, made a common risk assessment particularly difficult, as it became apparent that there were marked divergences between European Union Member States governments and government agencies on radiological hazards. This caused considerable disquiet to EU citizens in Japan… We suggest in addition that a mapping exercise, showing how each Member State arrives at its travel advice might be conducted, with a view to identifying stages at which other EU MS might be informed, if not consulted, about recommendations or advice. It may not be realistic to expect common advice in every situation, and the final decision will rest with MS of course, but one suggestion is to explore harmonization of levels [degrees/stages] of warning, so that at least we are all working within more or less the same system (HOMS Report, 2012). The EU States predictably diverged along political lines (one diplomat I interviewed joked frankly that “we can’t agree on anything else, so I don’t know why we would agree on this”) but a central aspect of the politics of the crisis was the differences in nuclear policy, not only for nuclear energy but especially the associated military priorities of states who have nuclear weapons. These alliances influenced the international response to the nuclear crisis. The International Atomic Energy Association (IAEA) played a remarkably minor role in sorting the nuclear crisis and only entered the picture months later, as a number of the member states for this international organization are not nuclear allies to the U.S./Japan, and so the military-based surveillance data, the security of nuclear materials (especially the spent fuel pools) and internal decision making processes were not shared with states outside this nuclear alliance. [i] The only countries with whom the U.S. was having daily conferences in which detailed information was conveyed were England, France (who reprocesses spent nuclear fuel for Japan), Canada and Finland, all of which had technical expertise relevant to the reactors. 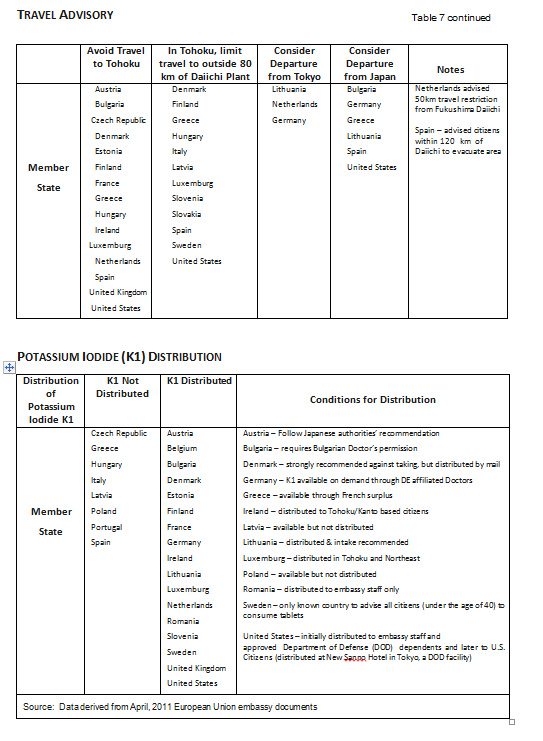 Table 7 provides information on the institutional responses of some European Union States’ embassies and for select foreign embassies in Japan. The staffing at embassies reflected the assessments that were being made about the severity of the situation, and indicates the differences in perceptions of the crisis, and the demands of political alliances among the various countries. The European Union member states convened daily meetings, with additional conference calls, in a continuous flow of information between the embassies. Ambassadors from the twenty-five EU States in Japan met face-to-face at least seven times in the first two months, and while they shared common concerns, their respective policies diverged (Warren, D., personal communication, January 27, 2012). For weeks on end, foreign embassies were converted from normal operations to emergency response centers with staff worked around the clock, monitoring the situation and coordinating with offices in their home countries. The demands were unrelenting: people calling in to inquire about food safety, seeking advice on relocation or departure from Japan altogether (and who would pay for travel costs), questions about school closings and relocations, what to do about their pets, and asking if Potassium Iodide would be available[i]. For this study, I interviewed senior diplomats in the Japanese PM Office, the United States, Canadian, German, French, British and the European Union Delegation. Despite the cultural differences and incompatible politics between these various countries, they all shared a common set of experiences in terms of their institutional responses to the crisis. The larger embassies convened a series of information sessions both in Japan and abroad in which nuclear experts and public health authorities provided summary assessments to placate their increasingly anxious constituents (Beddington, J., personal communication, February 27, 2013). The Embassies thus served as gatekeepers of information, providing encapsulated summaries of media reports for those who could not understand the Japanese media (the British Embassy, for instance, had 5 staff monitoring Japanese media 24 hours per day, providing summary briefings 3 times daily), while juxtaposing these reports with the policies being put forth by their respective governments. At the beginning of the crisis, NHK, the government run broadcast channel on Japanese television, simply conveyed TEPCO’s claims to a worried public, essentially operating as a PR device for their agenda. In stark contrast, social media and the foreign press, many of whom relied on authorities critical of the nuclear industry for their coverage, played up worse case scenarios and called into question the assertions being made by TEPCO. Social media played a significant role in establishing a consistent flow of anti-government information, and as frustrating as this deluge of critical information may have been to embassy officials, it provided immediate feedback to government authorities who might not otherwise have acknowledged the magnitude of discontent within their own communities. As we look to the early days of the crisis it is tempting to place a shelf-life on panic oriented risk discourses and fix these frameworks of interpretation in time, to conclude that after a somewhat hysterical first few weeks, the crisis abated, taking with it these unreasonable claims. However, over time critical media coverage has led to a gradual amplification of risk about nuclear danger that has given credence to claims previously taken as an over-reaction and panic. These adjustments have happened incrementally as stories have broken in the media that were previously known only to insiders, and as various government agencies and independent panels have submitted reports, all of which reveal more nuanced information about particular episodes in the crisis. This information has provided ammunition to critics (and little comfort to industry supporters), as the overall picture that emerges is one of a lack of preparation, well-intentioned ineptitude, poor communication and tone-deaf politics. These evaluations, coming from various parties distributed across the political spectrum, map onto anti-government political agendas, lending credence to anti-nuclear activists, who had anticipated such a crisis. [i] The importance of the US – Japan Alliance for American interests is indicated by the amount of government resources that were devoted to the conjoined disasters. Initially USAID took on administrative control of the non-military response in tsunami relief efforts, and then as the nuclear crisis developed, coordinated logistics for the Nuclear Regulatory Agency (NRC), the Environmental Protection Agency, The Department of Energy (DOE), The Food and Drug Administration (FDA), and The Centers for Disease Control (CDC). [ii] The explosion of reactor 1 took everyone by surprise: this explosion was unprecedented in the nuclear industry. While the possible release of hydrogen had been modeled and was factored into new reactor designs (which have hydrogen igniters and containment structures much larger than the antiquated Mark I design), such an explosion was unexpected, leading an NRC official I interviewed to state “we knew that volatile gasses could be released, but we never thought it would cause an explosion that would blow the freakin’ roof 300 meters into the air!” The explosion of the reactor 1 building broke windows 3km distance from the plant, leading experts to believe that the primary containment structure had exploded. [iii] The “voluntary departures” were controversial: alongside the approximately 160,000 foreign citizens who left Japan in this crisis, the military and embassy dependents who took advantage of this opportunity to depart without cost were labeled “Fly-Jin” (a contraction of the Japanese word “Gaijin,” a derogatory slang for a foreigner) and were accused of using the crisis as an occasion to take a paid holiday while waiting out the crisis. This label had originated on Twitter feeds as a sarcastic pun, and came to be used more generally to describe foreigners who had abandoned Japan out of fear for personal safety (de L Grange, 2011). [iv] In a daily briefing by the NRC to U.S. federal agencies in April 2011, it is noted that “the IAEA has requested permission to share the NRC Situation Reports (SitRep) with the Chinese government. OIP was advised this document should not be shared. Concerns with any plan to share the SitRep with the Chinese Government are: 1) U.S. States have been denied access to this document and 2) if we share the document with the Chinese Government, this precedent could obligate us to honor requests from other international stakeholders as well (NRC Freedom of Information Act Document, April 22, 2011, p. 67). [v] The distribution of Potassium Iodide (K1) was a difficult issue to address, because it is a restricted substance in Japan, but given the demands of the crisis, the Japanese government waived this restriction and allowed foreign embassies to distribute K1 to their citizens. Although some governments made K1 available, many held a tight reign, setting up conditions for distribution and in some cases, claiming it was available but never providing a means to get it into the hands of the worried public. Adding to the difficulty was the fact that assessments were changing daily – sometimes hourly – and so while governments initially made efforts to procure K1 and inform their citizens, they were reluctant to distribute it unless it was absolutely necessary (for adults over the age of 40, the side effects may outweigh the medical benefit). European State Delegation (March 11, 2012). HOMS Report (draft): One Year on March 11th – Review of the Lessons Learned from the Crisis. Tokyo. Feickert, Andrew and Emma Chanlett-Avery (March 22, 2011). Japan 2011 Earthquake: U.S. Department of Defense (DOD) Response. Congressional Research Service. Nuclear Emergency Response Headquarters, Government of Japan (June, 2011). Report of Japanese Government to the IAEA Ministerial Conference on Nuclear Safety: The Accident at TEPCO’s Fukushima Nuclear Power Stations. Rebuild Japan Initiative Foundation (March 11, 2012). Fukushima Nuclear Accident Independent Investigation Report. Tokyo: Discover 21. Sasakawa Peace Foundation (2012, September). The Fukushima Nuclear Accident and Crisis Management: Lessons for Japan-U.S. Allliance Cooperation. Final Report of the SPF Research Project on “Assessment: Japan-S Response to the Fukshima Crisis. Sposato, William (October 22, 2011). Media Reporting and Risk Management After the March 11 Disaster. Japan Echo, Tokyo: Japan Echo Foundation. U.S. Government Printing Office (2011, March 29). Nuclear Power Plant Tragedy in Japan: Briefing Before the Committee on Energy and Natural Resources United States Senate (112th Congress). Washington, D.C.
Kyle Cleveland is Associate Professor of Sociology at Temple University’s Japan Campus in Tokyo and is the founding Director of TUJ’s Institute of Contemporary Asian Studies, for which he organizes a lecture series, academic conferences and symposia. As the university’s Study Abroad Advisor, he was involved in the university’s crisis management, serving as a liaison to U.S.-based study abroad providers, and at the height of the nuclear crisis chaperoned an emergency evacuation flight out of Japan with international students. He is writing a book on the political dimensions of radiation assessment in the Fukushima nuclear crisis, examining how foreign governments in Japan responded to the crisis. Your findings are fascinating, particularly since so much commentary on official decisions has been based on media coverage and framed from afar. I especially appreciated your discussion of embassies as gatekeepers of information and the diplomatic finesse required to follow safety guidelines that differed from the host government’s. In a longer version, are you planning to include more material from the interviews? It might be worth noting that while official statements and social media provided very different impressions of what was going on, as you say, the anonymity of some key social media sites–notably the Reuters Live Blog, I believe the first set up to cover a disaster in realtime–allowed insiders to convey a certain amount of inside information to outsiders as the crisis was unfolding. Contributors to the blog who understood Japanese often translated for those who didn’t. Those files are still archived online. Kyle, nice job on the article! I really enjoyed the tremendous amount of information you brought to bear on the subject, ranging from the interviews with bureaucrats and diplomats to popular press reports. I wondered if the next direction to take the paper is a theoretical framework which would help tie together these findings? That is, are there previous studies of disaster communication and information distribution to which you could tie your results? Hello Kyle, reading your discussion of insider uncertainty, especially over the mileage for the radiation exclusionary zone, reminded me of outsider uncertainty exchanged in the international media sphere. Media outlets definitely picked up on the discrepancies between the two ranges in news reports (only fueling the international media’s dramatic stories of radiation in Tokyo, for example). Not to mention similar responses from non-Japanese citizens in Japan, who advertised their uncertainties and frustrations on social media of both International news reports and the US embassy’s handling of it. I wonder if you came across in your interviews with officials a reaction to the “flyjin” response, which could be viewed as a very physical manifestation of feedback? Also, I was wondering if the embassies are now embarking on new digital means to stay in contact with their citizens. You have illuminated a realpolitik of disaster response that is too often absent in STS analysis. Because of TEPCO’s ineptitude US/Japan relations were placed in jeopardy, and a full-scale diplomatic incident was in the offing. Phenomenal material here. I’m on board with Scott here. There are significant methodological implications for how you got to this conclusion — the need to think beyond the “usual suspects” — in this case, discussions with diplomatic corps — rather than to just zero in on key data narrowly. There is a broader literature on the role of international relief efforts, especially as regards famine, that might be of interest, e.g., Howe, Peter. “Priority Regimes and Famine.” In The New Famines: Why Famnines Persist in an Era of Globalization, edited by Stephen Devereux, 336-62. New York and Oxon: Routledge, 2007. I found narrative about the unfolding of the crisis really insightful. First because, having experience the complicated relations between expats and embassy (well … I guess I can say it: the French) I can relate to this stressful momentum where you need to make rational decisions about something you knew nothing about a day before. I agree with your conclusion that reading people’s reaction as irrational is a misinterpretation. As one respondent of my field research (earthquakes in SF) told be, “if you not scared when your house is crumbling down, you’re insane!” So fear is a normal reaction, which is taken in a complex network of events, ideas and I would say distance. Because that is the other thing that really struck me in your account: the plasticity of distance, both metric and intellectual. I really like that your piece is showing very well the transformation of a pre-established situation: a diplomatic, scientific, geographic and emotional status quo is thrown away. Finally I was very interested by your account of the difference. It is well known among expats that each country embassy has a certain ‘ethos’ –a complex assemblage of history, foreign policy,diplomacy, cultural clichés – but which, as far as I can tell, has also a lot to do with the personality (as subject) of the people in function. Which bring me to my last point, I would be very curious to know, among the people what is their understanding of science, technology, risk, safety, etc. having them define this concepts would also be very helpful to understand how/why did they react during the crisis. In other words, how the “subject at risk” could find a place within the very interesting narrative that you are deploying. Thank you for this interesting paper. I share much of the comments above, so just a few complementary remarks. Your article makes me remember so many (unpleasant) moments… like the employees from Areva who flied from Fukushima as soon as March 11, then the ‘solidarity’ visit of French President Sarkozy and his declaration full of cultural clichés (Japanese long tradition of bravery when faced to natural disasters, etc); his visit was resented by many Japanese as a gesture to maintain the contracts with Areva, and prevent a raise of antinuclear feelings in France. Etc. “Social construction of risk”? After Hacking’s “Social construction of what?” and Latour’ “Reassembling the social”, it has become more difficult to take “social construction” as a framework for analysis, though we cannot exclude that dimension. Rather than the “social construction of risk”, your research is perhaps more about “destruction” or how long the destruction will take before the “re-construction”. Prime Minister Kan talked of 3.11 as the worst “crisis” since the 1945 defeat (or did he say “shusen”?). The parallelism between 3.11 might be a good way to pursue on the differences between construction and re-construction. Thank you for this very interesting paper! I would love to hear a bit more about the long-term effects: how are the different embassy’s reactions dealt with in today’s daily life, for example in trade and business relations? It’s certainly right not to call these responses irrational. But following Daniel Aldrich’s suggestion, I wonder how organizational sociologists, diplomatic historians, and media/communications scholars would analyze these miscommunications and events that unfolded. Certainly, the kind of chaotic response described here is endemic to any complex disaster (and what disaster is not complex), and as you move towards a normative assessment of the responses, as you implicitly do, what approaches would give you the best framing (and for what ends)? Wow, this was a densely informative, compact and frankly riveting narrative, deftly told. I second Daniel’s question about theoretical analysis, and I would love to see what the answer might look like if you chose to take Charlotte’s provocative insight about the “plasticity of distance” as one point of departure. Kyle — this is an excellent account of the divergent paths embassies took after 3.11, and particularly illuminating on how the US came to its conclusions. As per some of the reviewer comments, I wonder if this article could be in dialogue with some of the political science literature on “constructivism.” Peter Katzenstein’s “The culture of national security,” and the literature it provoked might be a useful interlocutor. Their focus is on the power of ideas in affecting political processes, and it sounds like you have an excellent case here on how different political ideologies (need to preserve the bases, anti-nuclear sentiment in Germany) led to varied responses. Such an excellent paper, Kyle–many thanks. As I was reading, I was also struck with the calculations the US government made in deciding whether to expand the evacuation zone, and it made me wonder if there was any consideration of risk perception with regard to US reactors. In other words, in my own work, I see nuclear experts in the US immediately moving to calm American fears about nuclear safety following Fukushima, and so I’m wondering if there was an effort here to appear particularly proactive, or to confirm the industry’s reputation as particularly safety oriented. Perhaps I’m engaging in conspiracy speculation here, but when I read your paper I immediately assumed that there might also be a PR aspect to the expansion of the evacuation zone. Great paper, Kyle. Recalling the title of Fuller’s book, “We almost Lost Detroit” (on the Fermi 1 partial meltdown in 1966) your narrative illuminates just how badly things may have gone. The events at Fukushima went horribly bad, and the assessment of human, social, and economic damages is only just beginning. But the potential domino effect from Dai-ichi to Dai-ini, the potential abdication by TEPCO, and the possibility of a nuclear pan-disaster are beyond the unthinkable. That may be why they are, in fact, not being thought, except when works like yours remind us. Quite a bit of what you’ve described was suggested in real time or shortly after, but the tendency was to dismiss the most extreme scenarios as hysteria, as anti-nuclear propaganda, or as simply implausible because they were too terrible to contemplate. At the present point in time, these possibilities have largely been forgotten in media, political, organizational, and institutional discourses. This is not “mere” forgetting in an everyday sense–it’s a product of institutional, social, cultural, and political action. Your essay reminds us not to forget. I’m thinking as well of the reactor vessel head near-failure at the Davis Besse plant, discovered in 2002 but years in the making– that could have been a catastrophe. Or how things at TMI could easily have been far worse than they were. One way to look at these events is to say, look how safe we are–we catch these problems before the worst happens. We just have to tweak the system a bit, making use of “lessons learned,” and we’ll be even safer. Plenty of folks are saying just that. Another response is is to say, OMG, we’ve dodged the bullet more times than we care to remember, let’s hope our luck continues. Stepping out of emotional citizen mode and into rational academic mode. let me say that you’ll likely be challenged to guarantee the validity of the story you tell. So more detail on your methods and your validity warrants would add value as you develop this project further. Please do devlop it further!